Offers have flooded in for a house in Cambridge owned by Pink Floyd founder Syd Barrett. 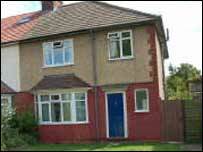 More than 40 people this weekend viewed the three-bedroomed house which is on the market for £300,000. Roger "Syd" Barrett, who died in July aged 60, moved into the 1930s-built house in 1981, having apparently walked to the city all the way from London. A spokesman for Cheffins estate agents told BBC News there had also been overseas interest in the house. Syd's sister Rosemary Breen said: "Roger loved the peace and quiet of St Margaret's Square, hearing children in the road playing and enjoying cycling to the local shops. "He put his stamp on the house with frequent redecoration, building his own furniture, changing doors etc. In the front room he did his drawing and painting and wrote at length about art history. "In the back room he relaxed and enjoyed listening to jazz. "Upstairs he slept in all the bedrooms, deciding which one as the mood took him."